We call for papers for our autumn conference Secularities - Patterns of Distinction, Paths of Differentiation (4–6 October 2018, Leipzig). Proposals should include an abstract (500 words max.) and a short bio of the speaker. Please send your proposal to Judith Zimmermann to be received by 31 March 2018. The detailed programme of our workshop Religion and medicine in pre-modern Asian and Islamicate cultures. Distinctions and differentiations in emic discourse and practices from 600 BC to 1600 AD is now online. The workshop is organised by Katrin Killinger and will take place from 14-16 March 2018 in Leipzig. 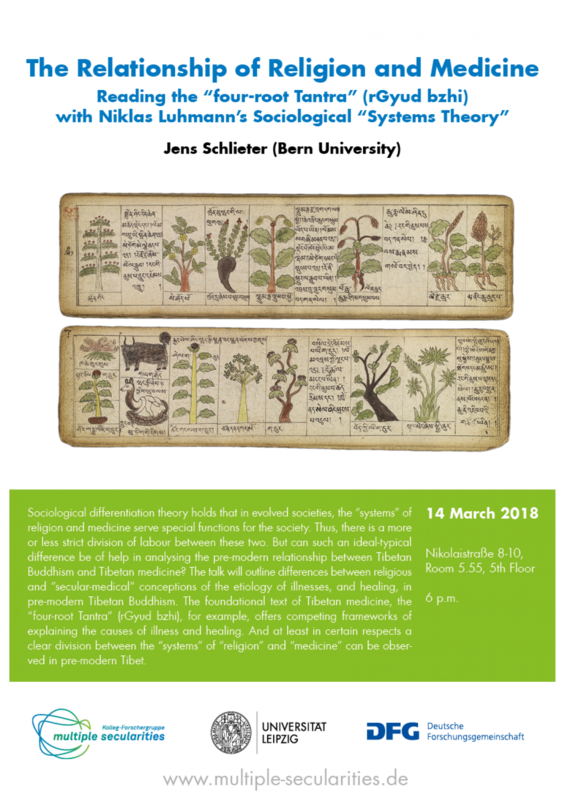 The keynote on The Relationship of Religion and Medicine: Reading the “four-root Tantra” (rGyud bzhi) with Niklas Luhmann’s Sociological “Systems Theory” by Jens Schlieter on 14 March will be public (Poster). 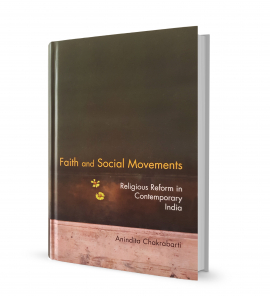 Our Senior Research Fellow Anindita Chakrabarti has recently published a monograph on Faith and Social Movements. Religious Reform in Contemporary India with Cambridge University Press. The KFG's director Christoph Kleine has published an overview on (secularity in) Japan before 1800 in our Companion to the Study of Secularities. The Companion is projected on a long-term basis. It will contain short articles in encyclopaedic form and style, which refer to the specific concepts and peculiarities of secularity in the respective regions and eras our members are specialised in. Our other director Monika Wohlrab-Sahr and our former Senior Researcher Marian Burchardt have published a paper on Revisiting the Secular. Multiple Secularities and Pathways to Modernity in our Working Paper Series. Neguin Yavari and Florian Zemmin have joined the KFG as Senior Research Fellows in the beginning of 2018. Neguin is working on The Lost Political in Medieval Islamic Thought, Florian's project is titled Sociology in the Arabic World - towards a Genealogy of Secularity in Islam. Our former Senior Researchers Marian Burchardt and Daniel Kinitz have recently left the KFG to join new projects. Marian now holds the Professorship in Transregional Sociology at Leipzig University, Daniel joined the project "Bibliotheca Arabica – A New History of Arabic Literature" at the Saxon Academy of Sciences in cooperation with Leipzig University. The KFG's Senior Researcher Mohammad Magout has received the Katharina-Winscheid-Prize at the Annual Reception of the Research Academy of Leipzig University in January 2018. This prize is given to a doctoral researcher at the Academy, who completed an outstanding dissertation under special circumstances and who deserves recognition for promoting gender equality and family-friendliness in the research environment. Mohammad Magout is the first male researcher to receive this prize. The KFG "Multiple Secularities - Beyond the West, Beyond Modernities" is willing to support the Philipp Schwartz Initiative for threatened researchers as a host. For a period of at least 24 months, one researcher could be hosted by the KFG. Applicants should send their documents by 15 March to: multiple-secularities@uni-leipzig.de.